Businesses and employees in NC want drug test locations to be convenient, reliable and fast. FastMed is the largest urgent care network in North Carolina, and the sixth largest urgent care network in the US. Our drug test locations are all across the state – use your zip code to find the one nearest you. 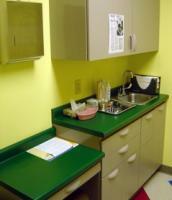 FastMed drug test locations all have on-site labs to conduct drug or alcohol tests. That’s particularly important if you’re looking for drug screening locations. Test results are fast, reliable and cost-effective – no need to ship samples to an outside vendor which can increase potential for error. Although the federal government requires employee drug testing in safety-sensitive industries (national defense, transportation or aviation), for the most part, state laws determine whether an employer may require drug testing. Drug tests must be performed a sanitary manner, respectful to the privacy and dignity of the individual. In the event of a positive drug test, workers can retest at the same lab or at another approved lab of their choice. The drug test locations at FastMed Urgent Care are walk-in clinics, open 365 days a year. Please check our occupational health services if you’d more information about setting up an account with FastMed.